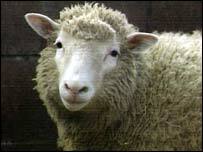 Scientists who cloned Dolly the sheep have been granted a licence allowing them to carry out controversial stem cell research. The work will use embryos no longer needed by couples undergoing IVF treatment. The Roslin Institute near Edinburgh will experiment on the special stem cells extracted from the embryos. The research team will also artificially stimulate donated human eggs in a process known as parthenogenesis. The stem cell research will test the effectiveness of new medical treatments for degenerative illnesses, such as Parkinson's disease and heart disease. Scientists hope to encourage the embryonic stem cells to develop into replacement tissues that can be transplanted into sick individuals to make them better. A better understanding of how to encourage eggs to mature outside the body may also help people undergoing IVF. In the past, the Roslin Institute, which gave the world the first mammal to be cloned from an adult cell, has expressed interest in developing human embryonic clones. 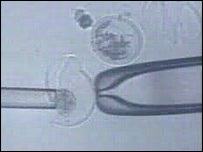 Although the licence granted by the Human Fertilisation and Embryology Authority (HFEA) in no way permits human cloning to produce babies, it could pave the way for improved techniques, making the creation of a human clone possible. Researchers would have to apply separately to be allowed to take the science further. A HFEA spokeswoman said it would be impossible to develop a human clone from the procedures involved in parthenogenesis. "Parthenogenesis is not cloning because you have only got half the DNA in the cells, which are not capable of developing into a clone." And HFEA chair Suzi Leather said the licence for research using donated embryos would be stringently monitored. "It is important that any research involving human embryos is scrutinised and properly regulated," she said. "In years to come we think stem cells offer huge benefits as cell transplants to help patients who suffer from heart disease or Parkinson's. "It's hoped you will be able to take these cells, put them into peoples' bodies and they will in effect mend the cells that are not functioning properly. "But the medical applications are a long way down the line and it's important that we do the underpinning scientific work and that's what the Roslin has been licensed to do." The HFEA was given the power to licence parthenogenesis after a ruling by the House of Lords in March 2003 clarified the law regarding the regulation of embryos created outside the body. "In years to come we think stem cells offer huge benefits"